Climbing that far does take quite a lot of effort as the Klettersteig Pfeilspitzwand throws a few challenges at you. Like the Klettersteig Huterlaner I’d done a few days before, the Klettersteig Pfeilspitzwand runs up a series of buttresses and rock faces that stand out from a tree-covered hillside. It’s the longest of the via ferrate above the town of Mayrhofen and has an overall grade of B/C+. However, the climbing is mostly on sections graded B and C grade, with a couple of strenuous D- sections. One of those D- sections is at the start and it packs quite a punch. The via ferrata goes to one side of a large overhang and then over its steep top edge. The topo calls this overhang the Kathedrale. Climbing the lip of this cathedral required pulling hard with my arms while trying to push myself up on feet that I had to keep stretching and swapping between small stemples. It was demanding, exposed and technical climbing. The rest of the via ferrata was a fun and engaging mixture of hard and easier climbing, with some great, flake handholds. But by the time I had passed the bell I was wishing that I had brought more water as I roasted in the warm sunshine and the heat that radiated off the rock. Thankfully, Valerie generously shared some water with me. I was soaked in sweat and tired by the end of the Klettersteig Pfeilspitzwand, but satisfied and elated. 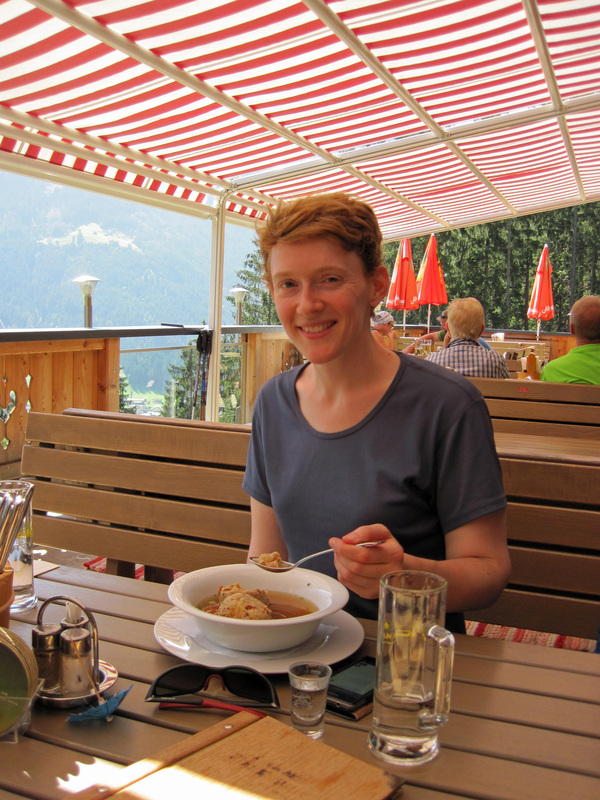 Valerie and I then took the short walk through the woods to a guesthouse to recuperate with Tyrolean stew, ice cream and lots and lots of water. Valerie at the Gasthaus Zimmereben. There’s a great booklet on the via ferrate and climbing in the Zillertal that is available in local tourist information offices and online. This includes a description and topo for the Klettersteig Pfeilspitzwand. There’s also a good overview of information on the via ferrate by Mayrhofen, including the Klettersteig Pfeilspitzwand, on the local tourist information website. In addition, the German language via ferrata website bergsteigen.com has a topo, photos and description of the Klettersteig Pfeilspitzwand. That looks great. We were just down the road from you plodding round the Stubai. Great weather. It was really good. Beautiful scenery and a great climb. I’d love to go to the Stubai as well at some point. I could see the challenge of wanting to ring the bell but it just too big a drop for me – I can cope with a couple of hundred feet and, although a much bigger drop shouldn’t make a difference, looking at your photos there, I’m afraid it seems it would to me! It also looks really, really strenuous – I’m not good at overhangs at the best of times as my arms aren’t terribly strong! It was a fairly big drop, but I was so busy concentrating on climbing that I didn’t really think about it. The climbing was a bit strenuous though. Looks like an exciting route! That it was, particularly getting over the cathedral section.